” Skelligs Arch ” canvas print is from a series of pictures born out of Rod Coyne’s regular painting pilgrimages to what is now known as the Wild Atlantic Way. Rod Coyne’s canvas print is the perfect addition to any home or office, likewise budding collectors, Ireland and Star Wars fans alike. This fine art print is available in three sizes. It is framed and the price includes FREE WORLD WIDE delivery. ” Skellig Arch ” the original oil painting is available here. See more canvas prints here. Location: Skelligs, Co. Kerry, Ireland. ” Skelligs Arch ” – How the West was Won! Rod Coyne painted ” Skelligs Arch ” as a live painting demonstration during his “Waters Soft & Wild” exhibition at Dr. Noelle Campbell-Sharp’s Origin Gallery in October 2015. This demo was captured with a time lapse camera. Sit back a see just how this little part of the West was Won by a demented artist wielding a palette knife. Ireland’s County Kerry has been a tourist destination since Queen Victoria visited the Lakes of Killarney in the 1800’s. From that point onward the Kingdom, as its known locally, has grown in appeal throughout the decades. It attracts anyone with an eye for the romantic beauty of remote isolation, outdoor types with a spirit of adventure, literary types in search Irish story telling and geologists looking for singular examples of continental shift. Fair to say that the area has a lot to offer. And in recent times this tourist trail has become part of an even greater area, encompassing the whole western coast known as the Wild Atlantic Way. Skellig Michael and the Skellig Beag stand proudly and somewhat lonely on the Atlantic horizon. They are monumental, majestic sentinels with an air of physical impossibility about them. The first Irish settlers must have marveled at their sight ten thousand years ago. And millennia later the early Christians were equally captivated by the grandeur of these islands. And around six hundred fifty BC those same Christians decided that their presence presented the ultimate challenge to their faith. Thus by colonizing Skellig Michael and living a life of extreme hardship they would prove beyond doubt their dedication to their christian God. 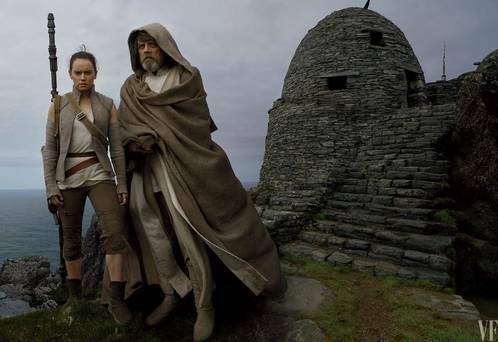 So it is little wonder that the later Star Wars story line had the reclusive Jedi Knight hiding away on one of our worlds most remote bastions. Dressed like like a monk of old Luke himself paints a majestic picture of solitude peering into the distance as many did before him. But of course the truth is always stranger than fiction.